The proposed mine was owned by Vancouver based Radius Gold at the time of the shooting. Radius sold off its stake in the project to Nevada-based Kappes, Cassiday & Associates (KCA) in August of 2012. KCA is a privately held metallurgical services company. No stranger to violence against mine opponents, Simon Ridgway, Chair of the Board of Radius Gold at the time of Orquelí’s shooting, was the front man of Fortuna Silver when Bernardo Vásquez was murdered in Oaxaca in March of this year. 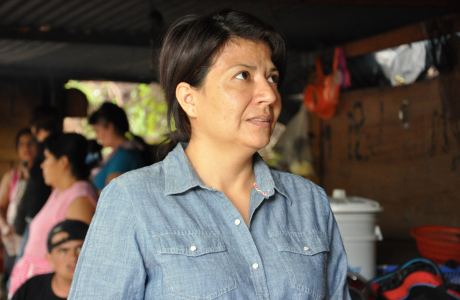 “We don’t fight over the gold – we fight for life, for our water, to keep sowing corn and beans, which is what we campesinos live from,” said Irma Esperanza, who was on shift at the blockade, preparing lunch in the kitchen. Behind her, three huge pots bubbled over small fires. “Here the mining is inside our community and there’s many of us who will be impacted,” she said.